The new HTC One (M8) has the potential to be one of fastest Android devices in our 3DMark benchmark performance rankings. Instead, it appears delisted and without a score, below 1000 other models at the bottom of our rankings. Unlike other benchmark makers who carelessly list and leak scores from unreleased hardware without verification, our 3DMark Best Smartphones and Tablets list only includes publicly available models that have been tested and reviewed by the press. Models that fail to comply with our benchmark rules are delisted, ensuring that our rankings are fair and accurate. 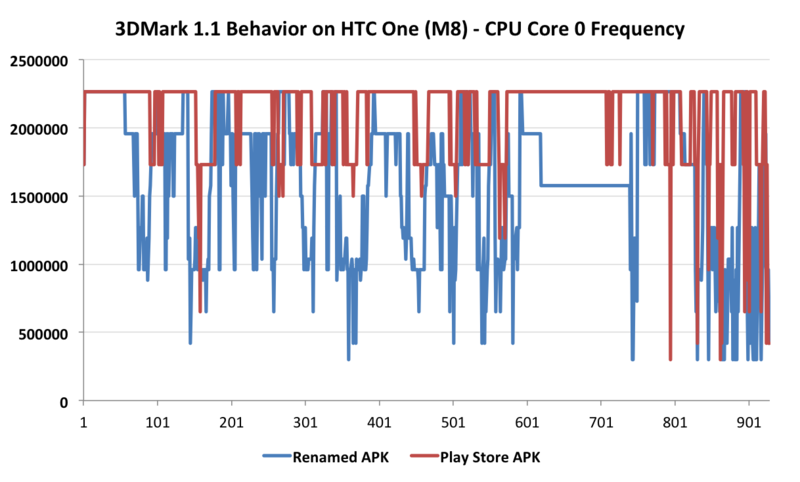 The chart shows how the HTC One (M8) behaves when running the public version of 3DMark in the Play Store compared with running a renamed, but otherwise identical version of 3DMark not available to the public or manufacturers. As you can see, the average CPU frequency is about 15% higher when running the public version of 3DMark, despite the two tests having identical workloads. The blue line shows the HTC One's real performance without the benchmark detection. "...our engineers optimize in certain scenarios to produce the best possible performance. If someone would like to get around this benchmarking optimization there are ways to do so, but we think most often this will not be the case." In fact, though the optimization can be enabled and disabled manually by users for other apps, it appears to be automatically and unavoidably enabled when running 3DMark, which makes it impossible to measure the HTC One's real-world performance. HTC defends its optimizations saying, "Benchmarking tests look to determine maximum performance of the CPU and GPU." This is a common misconception. The purpose of 3DMark, as with other Futuremark benchmarks, is not to measure maximum performance but to measure real-world performance. To do that, a device must run the benchmark as if it were any other application. When a device detects 3DMark, and modifies its behaviour as a result, the benchmark scores are no longer accurate and cannot be used to make fair comparisons between devices. We recently commended Samsung for removing the benchmark boosting effect from the Galaxy S IV and the Galaxy Note III. We hope this delisting will help persuade HTC to join them and realize the benefits of being fair and honest with their customers.